The LPS Zimbra Collaboration Suite is a full-featured messaging and collaboration application offering reliable, high-performance email, address books, calendaring and task list capabilities for LPS employees. Feel free to submit a HelpDesk Ticket for any technical issue you may be facing. The volume of email messages sent and received on a daily basis demands consideration of best practices for managing it. Consider these Email Management Strategies for processing your inbox and composing more effective communications. We all receive legitimate messages (updates from email lists, notifications from systems like Google Drive or Docushare, etc.) that don’t necessarily need immediate attention, but do tend to fill up our inbox. Using filters can help with organizing those messages into folders for you to review at an appropriate time, leaving your inbox with messages that probably need your more immediate attention. A filter evaluates every message you receive against a set of rules you have established, and acts upon the message in some way. The Activity Stream is a special filter with preset rules that moves messages sent through distribution lists to which you are subscribed, commercial mass marketing, and bulk mail messages from your Inbox to an “Activity Stream” folder. “Spam” is a term used to describe an email message of any content (but often commercial in nature) that was sent indiscriminately to large numbers of recipients on the Internet. To qualify as spam, a message must be unsolicited. A “phishing” email is designed to trick you into sharing personal information such as passwords, credit card numbers, etc. NOTE: Lincoln Public Schools will NEVER send you an email about meeting or exceeding your email quota. Learn more about Spam: What to do about it? Your immediate co-workers know you, as do many colleagues. Beyond that, even people who recognize your name may not remember what your role is within the district. Help everyone in the organization by having a “signature” automatically appended to the end of your messages. One of the lesser known features of Zimbra is the ability for it to subscribe to the RSS feed of a website right in your inbox. Click Accept Share in the email. The Accept Share dialog opens and describes the role granted to you. Before you accept you can customize the calendar name and select a color for messages to be displayed. Click Yes. The new shared calendar is added to your Calendar list and the message is automatically moved to your Trash folder. Use the ‘View’ link found in the URL options listed at the bottom of the ‘Share Properties’ dialog. NOTE: When adding events to your calendar, Zimbra will default to your personal calendar. To have the event appear on a specific course calendar, select it from the drop down in the event creation window. Go to the Preferences>Import/Export page. Browse to the .ics file on your computer. Select the folder for the file or create a new folder. Depending on the size of the .ics file, the import might take a few minutes. A resource calendar can be requested via HelpDesk ticket. Make sure to include thie following information in the ticket: calendar type, calendar administrator email address, and additional email addresses of those that should be able to ADD events to the calendar. You will be contacted for followup information, as each resource calendar and building is unique in how it is used. “Power” calendar users in LPS often rely upon the built-in applications on mobile devices for access to Zimbra calendars on the go. Many have lamented, however, that the sync only covers personal calendars. Administrators and coordinators often need access to various building calendars that don’t sync. For a less elegant but very functional solution, add a bookmark/shortcut for the mobile web view of Zimbra calendar to your device’s home screen. Calendar event reminders sent via SMS or email allow greater flexibility in how you can stay informed about upcoming meetings. Before you can use this feature, you must set up LPS Zimbra to be aware of the email address or phone number you want to use for these notifications. 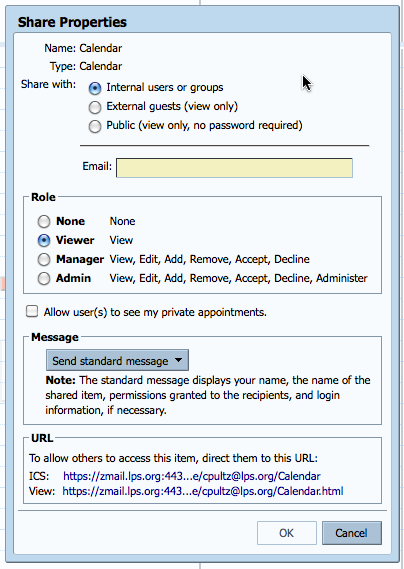 LPS provides a profile for syncing Zimbra with iOS devices. 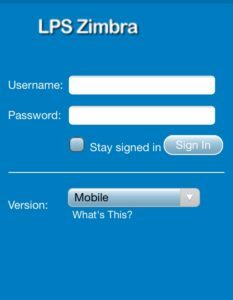 Visit zimbra.lps.org on your device and choose Version: Mobile on the login screen (if Zimbra detects you are on a mobile device, it may do this for you automatically). Don’t Accidentally Nuke Your Phone! If you have setup a mobile device to sync with Zimbra, a “Mobile Devices” preference panel becomes available. 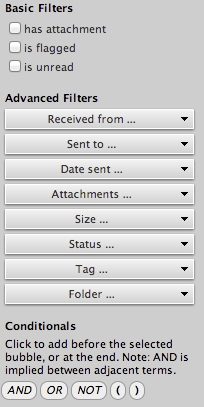 This is where you can remove a device from Zimbra (which ceases syncing). There’s something else you can do here, however, that is much more dangerous. If you choose “Wipe All Data from Device,” it does exactly that. Not only will it wipe out your Zimbra information, but it will wipe out ALL of your information. When your phone is done it will look just as it did when you got it (perhaps handy if you think your phone has been stolen, but might be the beginning of a bad day if not). 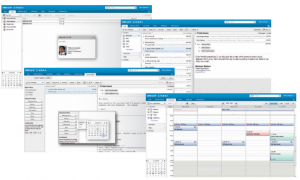 Zimbra offers amazing search capabilities. To begin with, it is FAST! Really! Try it! Most searches complete in about 1 second. It also offers tremendous granularity. When you create a search that feels “just right” you can save it for future 1-click access! Saved searches can eliminate the need for many of the folders that you have always managed by dragging messages in & out of them manually. Consider moving all of your messages into a single folder per year and using saved searches to find what you need, when you need it. Build your advanced search from the options on the left of the screen. 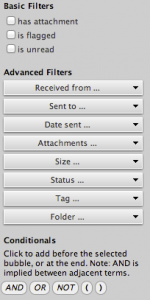 Narrow your results by searching who the message(s) were received from, who the message was sent to, when it was sent, what kind of attachments were included, the size, status, or tags and what specific folder the message might be located in. Combine any of these options using the conditionals at the bottom. If you look below your folders of email you should see a saved search with the title you provided. Clicking on it re-runs the search through all of your messages in all of your folders, including messages received since the search was saved. Another fast way to call up this search is to use a keyboard shortcut. 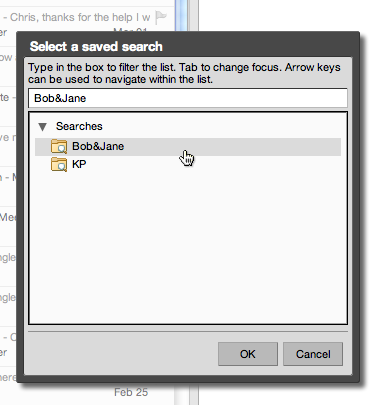 While viewing a folder of mail tap the “S” key on your keyboard to call up a window that shows your saved searches. Select the one you want to run. No mouse needed! To return to your inbox tap the “I” (for Inbox) key on your keyboard to return to your Inbox.